Sensors Expo preview – Booth 1045: Sensera to demonstrate MEMS sensor technology and IoT platform based on wireless location aware sensors at Sensors Expo | Location Running. 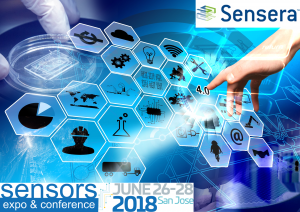 Woburn, MA, June 18, 2018 – Sensera Ltd. announces that it will be exhibiting at Sensors Expo in San Jose, California, Booth 1045, June 26-28, 2018. Sensera is a leading Internet of Things (IoT) solution provider that delivers sensor-based products across the vertical technology spectrum, from MEMS-based sensors to an entire IoT platform. Sensera’s MicroDevices division will demonstrate its core expertise in MEMS-based technologies, and its ability to bring custom microfabricated, sensor-based devices from concept to market, in applications including in vivo medical products, microfluidic structures for analytics and Organ On Chip (OOC) applications, and devices for industrial applications. The MicroDevices division offers fabrication and assembly services for emerging sensor applications requiring miniaturized components with optical, mechanical or electromechanical functionality. Sensera’s nanotron Technologies division, a leading provider of location awareness solutions, will showcase its latest swarm bee product family, which recently won the award for ‘best indoor location and proximity services’ at Geo IoT World. Nanotron’s swarm bee modules are the first and only common platform for both UWB and Chirp technologies. They allow mixing and matching UWB’s short-range cm accuracy, and the longer range of Chirp meter accuracy, with the exact same form factor and application programming interface (API). At 11am on June 27, Dr. Albers, CEO at Nanotron, will present a session of the conference titled “Location Awareness for Industrial IoT”. This session will be held in Meeting Room 212AB as a part of the ‘Machine Learning & AI’ track and will focus on the potential and benefits of location awareness within the context of various applications. Sensors Expo & Conference is North America’s premier event focused exclusively on sensors and sensor-integrated systems. Its conference will feature more than 100 speakers, and the exhibition will host more than 300 companies. For more information on Sensors Expo, see www.sensorsexpo.com. Sensera is a rapidly growing sensor-based location and situation awareness organization that provides end-to-end solutions and services in the rapidly growing world of the Internet of Things (IoT). Its Sensera Inc. division manufactures a family of proprietary microdevices and sensor systems that serve the MedTech, Industrial, Defense and Aerospace markets. The company’s nanotron subsidiary provides hardware and software that enables sophisticated location tracking for farm animals, mine safety and productivity, where its wireless tracking solution enables clients worldwide.